"Codon" redirects here. For the plant genus, see Codon (genus). A series of codons in part of a messenger RNA (mRNA) molecule. Each codon consists of three nucleotides, usually corresponding to a single amino acid. The nucleotides are abbreviated with the letters A, U, G and C. This is mRNA, which uses U (uracil). DNA uses T (thymine) instead. This mRNA molecule will instruct a ribosome to synthesize a protein according to this code. The genetic code is the set of rules by which information encoded within genetic material (DNA or mRNA sequences) is translated into proteins by living cells. Translation is accomplished by the ribosome, which links amino acids in an order specified by mRNA, using transfer RNA (tRNA) molecules to carry amino acids and to read the mRNA three nucleotides at a time. The genetic code is highly similar among all organisms and can be expressed in a simple table with 64 entries. The code defines how sequences of nucleotide triplets, called codons, specify which amino acid will be added next during protein synthesis. With some exceptions, a three-nucleotide codon in a nucleic acid sequence specifies a single amino acid. Because the vast majority of genes are encoded with exactly the same code (see the RNA codon table), this particular code is often referred to as the canonical or standard genetic code, or simply the genetic code, though in fact some variant codes have evolved. For example, protein synthesis in human mitochondria relies on a genetic code that differs from the standard genetic code. While the "genetic code" determines a protein's amino acid sequence, other genomic regions determine when and where these proteins are produced according to a multitude of more complex "gene regulatory codes". Serious efforts to understand how proteins are encoded began after the structure of DNA was discovered in 1953. George Gamow postulated that sets of three bases must be employed to encode the 20 standard amino acids used by living cells to build proteins. With four different nucleotides, a code of 2 nucleotides would allow for only a maximum of 42 = 16 amino acids. A code of 3 nucleotides could code for a maximum of 43 = 64 amino acids. The Crick, Brenner et al. experiment first demonstrated that codons consist of three DNA bases; Marshall Nirenberg and Heinrich J. Matthaei were the first to elucidate the nature of a codon in 1961 at the National Institutes of Health. They used a cell-free system to translate a poly-uracil RNA sequence (i.e., UUUUU...) and discovered that the polypeptide that they had synthesized consisted of only the amino acid phenylalanine. They thereby deduced that the codon UUU specified the amino acid phenylalanine. This was followed by experiments in Severo Ochoa's laboratory that demonstrated that the poly-adenine RNA sequence (AAAAA...) coded for the polypeptide poly-lysine and that the poly-cytosine RNA sequence (CCCCC...) coded for the polypeptide poly-proline. Therefore, the codon AAA specified the amino acid lysine, and the codon CCC specified the amino acid proline. Using different copolymers most of the remaining codons were then determined. Subsequent work by Har Gobind Khorana identified the rest of the genetic code. Shortly thereafter, Robert W. Holley determined the structure of transfer RNA (tRNA), the adapter molecule that facilitates the process of translating RNA into protein. This work was based upon earlier studies by Severo Ochoa, who received the Nobel Prize in Physiology or Medicine in 1959 for his work on the enzymology of RNA synthesis. Extending this work, Nirenberg and Philip Leder revealed the triplet nature of the genetic code and deciphered the codons of the standard genetic code. In these experiments, various combinations of mRNA were passed through a filter that contained ribosomes, the components of cells that translate RNA into protein. Unique triplets promoted the binding of specific tRNAs to the ribosome. Leder and Nirenberg were able to determine the sequences of 54 out of 64 codons in their experiments. In 1968, Khorana, Holley and Nirenberg received the Nobel Prize in Physiology or Medicine for their work. A codon is defined by the initial nucleotide from which translation starts and sets the frame for a run of uninterrupted triplets, which is known as an "open reading frame" (ORF). For example, the string GGGAAACCC, if read from the first position, contains the codons GGG, AAA, and CCC; and, if read from the second position, it contains the codons GGA and AAC; if read starting from the third position, GAA and ACC. Every sequence can, thus, be read in its 5' → 3' direction in three reading frames, each of which will produce a different amino acid sequence (in the given example, Gly-Lys-Pro, Gly-Asn, or Glu-Thr, respectively). With double-stranded DNA, there are six possible reading frames, three in the forward orientation on one strand and three reverse on the opposite strand. :330 The actual frame from which a protein sequence is translated is defined by a start codon, usually the first AUG codon in the mRNA sequence. In eukaryotes, ORFs in exons are often interrupted by introns. Translation starts with a chain initiation codon or start codon. Unlike stop codons, the codon alone is not sufficient to begin the process. Nearby sequences such as the Shine-Dalgarno sequence in E. coli and initiation factors are also required to start translation. The most common start codon is AUG, which is read as methionine or, in bacteria, as formylmethionine. Alternative start codons depending on the organism include "GUG" or "UUG"; these codons normally represent valine and leucine, respectively, but as start codons they are translated as methionine or formylmethionine. The three stop codons have been given names: UAG is amber, UGA is opal (sometimes also called umber), and UAA is ochre. "Amber" was named by discoverers Richard Epstein and Charles Steinberg after their friend Harris Bernstein, whose last name means "amber" in German. The other two stop codons were named "ochre" and "opal" in order to keep the "color names" theme. Stop codons are also called "termination" or "nonsense" codons. They signal release of the nascent polypeptide from the ribosome because there is no cognate tRNA that has anticodons complementary to these stop signals, and so a release factor binds to the ribosome instead. Examples of notable mutations that can occur in humans. During the process of DNA replication, errors occasionally occur in the polymerization of the second strand. These errors, called mutations, can affect the phenotype of an organism, especially if they occur within the protein coding sequence of a gene. Error rates are usually very low—1 error in every 10–100 million bases—due to the "proofreading" ability of DNA polymerases. Mutations that disrupt the reading frame sequence by indels (insertions or deletions) of a non-multiple of 3 nucleotide bases are known as frameshift mutations. These mutations usually result in a completely different translation from the original, and are also very likely to cause a stop codon to be read, which truncates the creation of the protein. These mutations may impair the function of the resulting protein, and are thus rare in in vivo protein-coding sequences. One reason inheritance of frameshift mutations is rare is that, if the protein being translated is essential for growth under the selective pressures the organism faces, absence of a functional protein may cause death before the organism is viable. Frameshift mutations may result in severe genetic diseases such as Tay-Sachs disease. Although most mutations that change protein sequences are harmful or neutral, some mutations have a beneficial effect on an organism. These mutations may enable the mutant organism to withstand particular environmental stresses better than wild type organisms, or reproduce more quickly. In these cases a mutation will tend to become more common in a population through natural selection. Viruses that use RNA as their genetic material have rapid mutation rates, which can be an advantage, since these viruses will evolve constantly and rapidly, and thus evade the defensive responses of e.g. the human immune system. In large populations of asexually reproducing organisms, for example, E. coli, multiple beneficial mutations may co-occur. This phenomenon is called clonal interference and causes competition among the mutations. Degeneracy is the redundancy of the genetic code. This term was given by Bernfield and Nirenberg. The genetic code has redundancy but no ambiguity (see the codon tables below for the full correlation). For example, although codons GAA and GAG both specify glutamic acid (redundancy), neither of them specifies any other amino acid (no ambiguity). The codons encoding one amino acid may differ in any of their three positions. 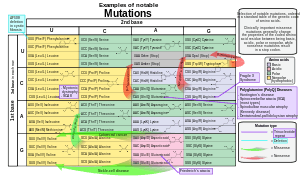 For example, the amino acid leucine is specified by YUR or CUN (UUA, UUG, CUU, CUC, CUA, or CUG) codons (difference in the first or third position indicated using IUPAC notation), while the amino acid serine is specified by UCN or AGY (UCA, UCG, UCC, UCU, AGU, or AGC) codons (difference in the first, second, or third position). :102–117 :521–522 A practical consequence of redundancy is that errors in the third position of the triplet codon cause only a silent mutation or an error that would not affect the protein because the hydrophilicity or hydrophobicity is maintained by equivalent substitution of amino acids; for example, a codon of NUN (where N = any nucleotide) tends to code for hydrophobic amino acids. NCN yields amino acid residues that are small in size and moderate in hydropathy; NAN encodes average size hydrophilic residues. The genetic code is so well-structured for hydropathy that a mathematical analysis (Singular Value Decomposition) of 12 variables (4 nucleotides x 3 positions) yields a remarkable correlation (C = 0.95) for predicting the hydropathy of the encoded amino acid directly from the triplet nucleotide sequence, without translation. Note in the table, below, eight amino acids are not affected at all by mutations at the third position of the codon, whereas in the figure above, a mutation at the second position is likely to cause a radical change in the physicochemical properties of the encoded amino acid. Grouping of codons by amino acid residue molar volume and hydropathy. A more detailed version is available. The frequency of codons, also known as codon usage bias, can vary from species to species with functional implications for the control of translation. 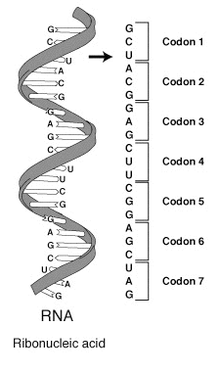 The following codon usage table is for the human genome. While slight variations on the standard code had been predicted earlier, none were discovered until 1979, when researchers studying human mitochondrial genes discovered they used an alternative code. Many slight variants have been discovered since then, including various alternative mitochondrial codes, and small variants such as translation of the codon UGA as tryptophan in Mycoplasma species, and translation of CUG as a serine rather than a leucine in yeasts of the "CTG clade" (Candida albicans is member of this group). Because viruses must use the same genetic code as their hosts, modifications to the standard genetic code could interfere with the synthesis or functioning of viral proteins. However, some viruses (such as totiviruses) have adapted to the genetic code modification of the host. In bacteria and archaea, GUG and UUG are common start codons, but in rare cases, certain proteins may use alternative start codons not normally used by that species. In certain proteins, non-standard amino acids are substituted for standard stop codons, depending on associated signal sequences in the messenger RNA. For example, UGA can code for selenocysteine and UAG can code for pyrrolysine. Selenocysteine is now viewed as the 21st amino acid, and pyrrolysine is viewed as the 22nd. Unlike selenocysteine, pyrrolysine encoded UAG is translated with the participation of a dedicated aminoacyl-tRNA synthetase. Both selenocysteine and pyrrolysine may be present in the same organism. Although the genetic code is normally fixed in an organism, the achaeal prokaryote Acetohalobium arabaticum can expand its genetic code from 20 to 21 amino acids (by including pyrrolysine) under different conditions of growth. Despite these differences, all known naturally-occurring codes are very similar to each other, and the coding mechanism is the same for all organisms: three-base codons, tRNA, ribosomes, reading the code in the same direction and translating the code three letters at a time into sequences of amino acids. Genetic code logo of the Globobulimina pseudospinescens mitochondrial genome. The logo shows the 64 codons from left to right, predicted alternatives in red (relative to the standard genetic code). Red line: stop codons. The height of each amino acid in the stack shows how often it is aligned to the codon in homologous protein domains. The stack height indicates the support for the prediction. Variant genetic codes used by an organism can be inferred by identifying highly conserved genes encoded in that genome, and comparing its codon usage to the amino acids in homologous proteins of other organisms. For example, the program FACIL infers a genetic code by searching which amino acids in homologous protein domains are most often aligned to every codon. The resulting amino acid probabilities for each codon are displayed in a genetic code logo, that also shows the support for a stop codon. A The codon AUG both codes for methionine and serves as an initiation site: the first AUG in an mRNA's coding region is where translation into protein begins. 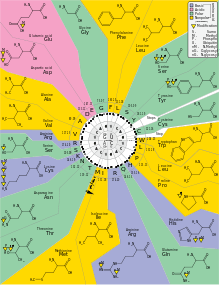 The DNA codon table is essentially identical to that for RNA, but with U replaced by T.
The origin of the genetic code is a part of the question of the origin of life. Under the main hypothesis for the origin of life, the RNA world hypothesis, any model for the emergence of genetic code is intimately related to a model of the transfer from ribozymes (RNA enzymes) to proteins as the principal enzymes in cells. In line with the RNA world hypothesis, transfer RNA molecules appear to have evolved before modern aminoacyl-tRNA synthetases, so the latter cannot be part of the explanation of its patterns. A consideration of a hypothetical random genetic code further motivates a biochemical or evolutionary model for the origin of the genetic code. If amino acids were randomly assigned to triplet codons, there would be 1.5 × 1084 possible genetic codes to choose from. :163 This number is found by calculating how many ways there are to place 21 items (20 amino acids plus one stop) in 64 bins, wherein each item is used at least once. In fact, the distribution of codon assignments in the genetic code is nonrandom. In particular, the genetic code clusters certain amino acid assignments. For example, amino acids that share the same biosynthetic pathway tend to have the same first base in their codons. This could be an evolutionary relic of early simpler genetic code with fewer amino acids, that later diverged to code for a larger set of amino acids. It could also reflect steric and chemical properties that had another effect on the codon during its evolution. Amino acids with similar physical properties also tend to have similar codons, reducing the problems caused by point mutations and mistranslations. Given the non-random genetic triplet coding scheme, it has been suggested that a tenable hypothesis for the origin of genetic code should address multiple aspects of the codon table such as absence of codons for D-amino acids, secondary codon patterns for some amino acids, confinement of synonymous positions to third position, a limited set of only 20 amino acids instead of a number closer to 64, and the relation of stop codon patterns to amino acid coding patterns. "Frozen accident": the genetic code has been randomly created. For example, early tRNA-like ribozymes may have had different affinities for amino acids, with codons emerging from another part of the ribozyme which exhibited random variability. Once enough peptides were coded for, any major random change in the genetic code would have been lethal, hence it is "frozen". Stereochemical affinity: the genetic code is a result of a high affinity between each amino acid and its codon or anti-codon; the latter option implies that pre-tRNA molecules matched their corresponding amino acids by this affinity. Later during evolution, this matching has been gradually replaced with the one performed today by aminoacyl-tRNA synthetases. Optimality: the genetic code continued to evolve after its initial creation, so that the current code reflects adaptation that maximizes some fitness function, usually some kind of error minimization. Chemical principles govern specific RNA interaction with amino acids. Experiments with aptamers showed that some amino acids have a selective chemical affinity for the base triplets that code for them. Recent experiments show that of the 8 amino acids tested, 6 show some RNA triplet-amino acid association. Biosynthetic expansion. The standard modern genetic code grew from a simpler earlier code through a process of "biosynthetic expansion". Here the idea is that primordial life "discovered" new amino acids (for example, as by-products of metabolism) and later incorporated some of these into the machinery of genetic coding. Although much circumstantial evidence has been found to suggest that fewer different amino acids were used in the past than today, precise and detailed hypotheses about which amino acids entered the code in what order have proved far more controversial. Natural selection has led to codon assignments of the genetic code that minimize the effects of mutations. A recent hypothesis suggests that the triplet code was derived from codes that used longer than triplet codons (such as quadruplet codons). Longer than triplet decoding would have higher degree of codon redundancy and would be more error resistant than the triplet decoding. This feature could allow accurate decoding in the absence of highly complex translational machinery such as the ribosome and before cells began making ribosomes. Information channels: Information-theoretic approaches model the process of translating the genetic code into corresponding amino acids as an error-prone information channel. The inherent noise (that is, the error) in the channel poses the organism with a fundamental question: how can a genetic code be constructed to withstand the effect of noise while accurately and efficiently translating information? These "rate-distortion" models suggest that the genetic code originated as a result of the interplay of the three conflicting evolutionary forces: the needs for diverse amino-acids, for error-tolerance and for minimal cost of resources. The code emerges at a coding transition when the mapping of codons to amino-acids becomes nonrandom. The emergence of the code is governed by the topology defined by the probable errors and is related to the map coloring problem. Game theory: Models based on signaling games combine elements of game theory, natural selection and information channels. Such models have been used to suggest that the first polypeptides were likely short and had some use other than enzymatic function. Game theoretic models have also suggested that the organization of RNA strings into cells may have been necessary to prevent "deceptive" use of the genetic code, i.e. preventing the ancient equivalent of viruses from overwhelming the RNA world. Stop codons: Codons for translational stops are also an interesting aspect to the problem of the origin of the genetic code. As an example for addressing stop codon evolution, it has been suggested that the stop codons are such that they are most likely to terminate translation early in the case of a frame shift error. In contrast, some stereochemical molecular models explain the origin of stop codons as "unassignable". H. Murakami and M. Sisido have extended some codons to have four and five bases. Steven A. Benner constructed a functional 65th (in vivo) codon. ↑ Turanov AA, Lobanov AV, Fomenko DE, Morrison HG, Sogin ML, Klobutcher LA, Hatfield DL, Gladyshev VN (Jan 2009). "Genetic code supports targeted insertion of two amino acids by one codon". Science. 323 (5911): 259–61. doi:10.1126/science.1164748. PMC 3088105 . PMID 19131629. ↑ Crick F (1988). "Chapter 8: The genetic code". What mad pursuit: a personal view of scientific discovery. New York: Basic Books. pp. 89–101. ISBN 0-465-09138-5. ↑ Nirenberg MW, Matthaei JH (Oct 1961). "The dependence of cell-free protein synthesis in E. coli upon naturally occurring or synthetic polyribonucleotides". Proceedings of the National Academy of Sciences of the United States of America. 47 (10): 1588–602. Bibcode:1961PNAS...47.1588N. doi:10.1073/pnas.47.10.1588. PMC 223178 . PMID 14479932. ↑ Gardner RS, Wahba AJ, Basilio C, Miller RS, Lengyel P, Speyer JF (Dec 1962). "Synthetic polynucleotides and the amino acid code. VII". Proceedings of the National Academy of Sciences of the United States of America. 48 (12): 2087–94. Bibcode:1962PNAS...48.2087G. doi:10.1073/pnas.48.12.2087. PMC 221128 . PMID 13946552. ↑ Wahba AJ, Gardner RS, Basilio C, Miller RS, Speyer JF, Lengyel P (Jan 1963). "Synthetic polynucleotides and the amino acid code. VIII". Proceedings of the National Academy of Sciences of the United States of America. 49 (1): 116–22. Bibcode:1963PNAS...49..116W. doi:10.1073/pnas.49.1.116. PMC 300638 . PMID 13998282. ↑ "The Nobel Prize in Physiology or Medicine 1959" (Press release). The Royal Swedish Academy of Science. 1959. Retrieved 2010-02-27. The Nobel Prize in Physiology or Medicine 1959 was awarded jointly to Severo Ochoa and Arthur Kornberg 'for their discovery of the mechanisms in the biological synthesis of ribonucleic acid and deoxyribonucleic acid'. ↑ Nirenberg M, Leder P, Bernfield M, Brimacombe R, Trupin J, Rottman F, O'Neal C (May 1965). "RNA codewords and protein synthesis, VII. On the general nature of the RNA code". Proceedings of the National Academy of Sciences of the United States of America. 53 (5): 1161–8. Bibcode:1965PNAS...53.1161N. doi:10.1073/pnas.53.5.1161. PMC 301388 . PMID 5330357. ↑ "The Nobel Prize in Physiology or Medicine 1968" (Press release). The Royal Swedish Academy of Science. 1968. Retrieved 2010-02-27. The Nobel Prize in Physiology or Medicine 1968 was awarded jointly to Robert W. Holley, Har Gobind Khorana and Marshall W. Nirenberg 'for their interpretation of the genetic code and its function in protein synthesis'. 1 2 Mulligan PK, King RC, Stansfield WD (2006). A dictionary of genetics. Oxford [Oxfordshire]: Oxford University Press. p. 608. ISBN 0-19-530761-5. ↑ Touriol C, Bornes S, Bonnal S, Audigier S, Prats H, Prats AC, Vagner S (2003). "Generation of protein isoform diversity by alternative initiation of translation at non-AUG codons". Biology of the Cell / Under the Auspices of the European Cell Biology Organization. 95 (3–4): 169–78. doi:10.1016/S0248-4900(03)00033-9. PMID 12867081. ↑ Edgar B (Oct 2004). "The genome of bacteriophage T4: an archeological dig". Genetics. 168 (2): 575–82. PMC 1448817 . PMID 15514035. ↑ Maloy S (2003-11-29). "How nonsense mutations got their names". Microbial Genetics Course. San Diego State University. Retrieved 2010-03-10. ↑ References for the image are found in Wikimedia Commons page at: Commons:File:Notable mutations.svg#References. ↑ Griffiths AJ, Miller JH, Suzuki DT, Lewontin RC, et al., eds. (2000). "Spontaneous mutations". An Introduction to Genetic Analysis (7th ed.). New York: W. H. Freeman. ISBN 0-7167-3520-2. ↑ Freisinger E, Grollman AP, Miller H, Kisker C (Apr 2004). "Lesion (in)tolerance reveals insights into DNA replication fidelity". The EMBO Journal. 23 (7): 1494–505. doi:10.1038/sj.emboj.7600158. PMC 391067 . PMID 15057282. ↑ Chang JC, Kan YW (Jun 1979). "beta 0 thalassemia, a nonsense mutation in man". Proceedings of the National Academy of Sciences of the United States of America. 76 (6): 2886–9. Bibcode:1979PNAS...76.2886C. doi:10.1073/pnas.76.6.2886. PMC 383714 . PMID 88735. ↑ Boillée S, Vande Velde C, Cleveland DW (Oct 2006). "ALS: a disease of motor neurons and their nonneuronal neighbors". Neuron. 52 (1): 39–59. doi:10.1016/j.neuron.2006.09.018. PMID 17015226. ↑ Isbrandt D, Hopwood JJ, von Figura K, Peters C (1996). "Two novel frameshift mutations causing premature stop codons in a patient with the severe form of Maroteaux-Lamy syndrome". Human Mutation. 7 (4): 361–3. doi:10.1002/(SICI)1098-1004(1996)7:4<361::AID-HUMU12>3.0.CO;2-0. PMID 8723688. ↑ Crow JF (1993). "How much do we know about spontaneous human mutation rates?". Environmental and Molecular Mutagenesis. 21 (2): 122–9. doi:10.1002/em.2850210205. PMID 8444142. ↑ Lewis R (2005). Human Genetics: Concepts and Applications (6th ed.). Boston, Mass: McGraw Hill. pp. 227–228. ISBN 0-07-111156-5. ↑ Sawyer SA, Parsch J, Zhang Z, Hartl DL (Apr 2007). "Prevalence of positive selection among nearly neutral amino acid replacements in Drosophila". Proceedings of the National Academy of Sciences of the United States of America. 104 (16): 6504–10. Bibcode:2007PNAS..104.6504S. doi:10.1073/pnas.0701572104. PMC 1871816 . PMID 17409186. ↑ Bridges KR (2002). "Malaria and the Red Cell". Harvard. ↑ Drake JW, Holland JJ (Nov 1999). "Mutation rates among RNA viruses". Proceedings of the National Academy of Sciences of the United States of America. 96 (24): 13910–3. Bibcode:1999PNAS...9613910D. doi:10.1073/pnas.96.24.13910. PMC 24164 . PMID 10570172. ↑ Holland J, Spindler K, Horodyski F, Grabau E, Nichol S, VandePol S (Mar 1982). "Rapid evolution of RNA genomes". Science. 215 (4540): 1577–85. Bibcode:1982Sci...215.1577H. doi:10.1126/science.7041255. PMID 7041255. ↑ de Visser JA, Rozen DE (Apr 2006). "Clonal interference and the periodic selection of new beneficial mutations in Escherichia coli". Genetics. 172 (4): 2093–100. doi:10.1534/genetics.105.052373. PMC 1456385 . PMID 16489229. ↑ Watson JD, Baker TA, Bell SP, Gann A, Levine M, Oosick R (2008). Molecular Biology of the Gene. San Francisco: Pearson/Benjamin Cummings. ISBN 0-8053-9592-X. ↑ Yang et al. (1990) in Michel-Beyerle, M. E., ed. Reaction centers of photosynthetic bacteria: Feldafing-II-Meeting 6. Berlin: Springer-Verlag. pp. 209–18. ISBN 3-540-53420-2. ↑ Füllen G, Youvan DC (1994). "Genetic Algorithms and Recursive Ensemble Mutagenesis in Protein Engineering". Complexity International 1. 1 2 3 Elzanowski A, Ostell J (2008-04-07). "The Genetic Codes". National Center for Biotechnology Information (NCBI). Retrieved 2010-03-10. ↑ Jukes TH, Osawa S (Dec 1990). "The genetic code in mitochondria and chloroplasts". Experientia. 46 (11–12): 1117–26. doi:10.1007/BF01936921. PMID 2253709. ↑ Fitzpatrick DA, Logue ME, Stajich JE, Butler G (1 January 2006). "A fungal phylogeny based on 42 complete genomes derived from supertree and combined gene analysis". BMC Evolutionary Biology. 6: 99. doi:10.1186/1471-2148-6-99. PMC 1679813 . PMID 17121679. ↑ Santos MA, Tuite MF (May 1995). "The CUG codon is decoded in vivo as serine and not leucine in Candida albicans". Nucleic Acids Research. 23 (9): 1481–6. doi:10.1093/nar/23.9.1481. PMC 306886 . PMID 7784200. ↑ Butler G, Rasmussen MD, Lin MF, et al. (Jun 2009). "Evolution of pathogenicity and sexual reproduction in eight Candida genomes". Nature. 459 (7247): 657–62. Bibcode:2009Natur.459..657B. doi:10.1038/nature08064. PMC 2834264 . PMID 19465905. ↑ Taylor DJ, Ballinger MJ, Bowman SM, Bruenn JA (2013). "Virus-host co-evolution under a modified nuclear genetic code". PeerJ. 1: e50. doi:10.7717/peerj.50. PMC 3628385 . PMID 23638388. ↑ Krzycki JA (Dec 2005). "The direct genetic encoding of pyrrolysine". Current Opinion in Microbiology. 8 (6): 706–12. doi:10.1016/j.mib.2005.10.009. PMID 16256420. ↑ Zhang Y, Baranov PV, Atkins JF, Gladyshev VN (May 2005). "Pyrrolysine and selenocysteine use dissimilar decoding strategies". The Journal of Biological Chemistry. 280 (21): 20740–51. doi:10.1074/jbc.M501458200. PMID 15788401. ↑ Prat L, Heinemann IU, Aerni HR, Rinehart J, O'Donoghue P, Söll D (Dec 2012). "Carbon source-dependent expansion of the genetic code in bacteria". Proceedings of the National Academy of Sciences of the United States of America. 109 (51): 21070–5. Bibcode:2012PNAS..10921070P. doi:10.1073/pnas.1218613110. PMC 3529041 . PMID 23185002. ↑ Dutilh BE, Jurgelenaite R, Szklarczyk R, van Hijum SA, Harhangi HR, Schmid M, de Wild B, Françoijs KJ, Stunnenberg HG, Strous M, Jetten MS, Op den Camp HJ, Huynen MA (Jul 2011). "FACIL: Fast and Accurate Genetic Code Inference and Logo". Bioinformatics. 27 (14): 1929–33. doi:10.1093/bioinformatics/btr316. PMID 21653513. ↑ Nakamoto T (March 2009). "Evolution and the universality of the mechanism of initiation of protein synthesis". Gene. 432 (1–2): 1–6. 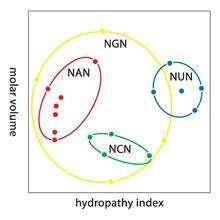 doi:10.1016/j.gene.2008.11.001. PMID 19056476. ↑ Ribas de Pouplana L, Turner RJ, Steer BA, Schimmel P (Sep 1998). "Genetic code origins: tRNAs older than their synthetases?". Proceedings of the National Academy of Sciences of the United States of America. 95 (19): 11295–300. Bibcode:1998PNAS...9511295D. doi:10.1073/pnas.95.19.11295. PMC 21636 . PMID 9736730. 1 2 Yarus M (2010). Life from an RNA World: The Ancestor Within. Cambridge: Harvard University Press. p. 163. ISBN 0-674-05075-4. 1 2 Freeland SJ, Hurst LD (Sep 1998). "The genetic code is one in a million". Journal of Molecular Evolution. 47 (3): 238–48. doi:10.1007/PL00006381. PMID 9732450. ↑ Taylor FJ, Coates D (1989). "The code within the codons". Bio Systems. 22 (3): 177–87. doi:10.1016/0303-2647(89)90059-2. PMID 2650752. ↑ Di Giulio M (Oct 1989). "The extension reached by the minimization of the polarity distances during the evolution of the genetic code". Journal of Molecular Evolution. 29 (4): 288–93. doi:10.1007/BF02103616. PMID 2514270. ↑ Wong JT (Feb 1980). "Role of minimization of chemical distances between amino acids in the evolution of the genetic code". Proceedings of the National Academy of Sciences of the United States of America. 77 (2): 1083–6. Bibcode:1980PNAS...77.1083W. doi:10.1073/pnas.77.2.1083. PMC 348428 . PMID 6928661. 1 2 3 4 Erives A (Aug 2011). "A model of proto-anti-codon RNA enzymes requiring L-amino acid homochirality". Journal of Molecular Evolution. 73 (1–2): 10–22. doi:10.1007/s00239-011-9453-4. PMC 3223571 . PMID 21779963. 1 2 Freeland SJ, Knight RD, Landweber LF, Hurst LD (Apr 2000). "Early fixation of an optimal genetic code". Molecular Biology and Evolution. 17 (4): 511–18. doi:10.1093/oxfordjournals.molbev.a026331. PMID 10742043. ↑ Crick FH (Dec 1968). "The origin of the genetic code". Journal of Molecular Evolution. 38 (3): 367–79. doi:10.1016/0022-2836(68)90392-6. PMID 4887876. ↑ Hopfield JJ (1978). "Origin of the genetic code: a testable hypothesis based on tRNA structure, sequence, and kinetic proofreading.". PNAS. 75: 4334–4338. doi:10.1073/pnas.75.9.4334. PMC 336109 . PMID 279919. 1 2 Yarus M, Widmann JJ, Knight R (Nov 2009). "RNA-amino acid binding: a stereochemical era for the genetic code". Journal of Molecular Evolution. 69 (5): 406–29. doi:10.1007/s00239-009-9270-1. PMID 19795157. ↑ Knight RD, Freeland SJ, Landweber LF (Jun 1999). "Selection, history and chemistry: the three faces of the genetic code". Trends in Biochemical Sciences. 24 (6): 241–7. doi:10.1016/S0968-0004(99)01392-4. PMID 10366854. ↑ Knight RD, Landweber LF (Sep 1998). "Rhyme or reason: RNA-arginine interactions and the genetic code". Chemistry & Biology. 5 (9): R215–20. doi:10.1016/S1074-5521(98)90001-1. PMID 9751648. ↑ Sengupta S, Higgs PG (2015). "Pathways of genetic code evolution in ancient and modern organisms". Journal of Molecular Evolution. 80: 229–243. doi:10.1007/s00239-015-9686-8. ↑ Brooks DJ, Fresco JR, Lesk AM, Singh M (Oct 2002). "Evolution of amino acid frequencies in proteins over deep time: inferred order of introduction of amino acids into the genetic code". Molecular Biology and Evolution. 19 (10): 1645–55. doi:10.1093/oxfordjournals.molbev.a003988. PMID 12270892. ↑ Amirnovin R (May 1997). "An analysis of the metabolic theory of the origin of the genetic code". Journal of Molecular Evolution. 44 (5): 473–6. doi:10.1007/PL00006170. PMID 9115171. ↑ Ronneberg TA, Landweber LF, Freeland SJ (Dec 2000). "Testing a biosynthetic theory of the genetic code: fact or artifact?". Proceedings of the National Academy of Sciences of the United States of America. 97 (25): 13690–5. Bibcode:2000PNAS...9713690R. doi:10.1073/pnas.250403097. PMC 17637 . PMID 11087835. 1 2 Freeland SJ, Wu T, Keulmann N (Oct 2003). "The case for an error minimizing standard genetic code". Origins of Life and Evolution of the Biosphere. 33 (4–5): 457–77. doi:10.1023/A:1025771327614. PMID 14604186. ↑ Baranov PV, Venin M, Provan G (2009). Gemmell NJ, ed. "Codon size reduction as the origin of the triplet genetic code". PLOS ONE. 4 (5): e5708. Bibcode:2009PLoSO...4.5708B. doi:10.1371/journal.pone.0005708. PMC 2682656 . PMID 19479032. ↑ Tlusty T (Nov 2007). "A model for the emergence of the genetic code as a transition in a noisy information channel". Journal of Theoretical Biology. 249 (2): 331–42. doi:10.1016/j.jtbi.2007.07.029. PMID 17826800. ↑ Sonneborn TM (1965). Bryson V, Vogel H, eds. Evolving genes and proteins. New York: Academic Press. pp. 377–397. ↑ Tlusty T (Feb 2008). "Rate-distortion scenario for the emergence and evolution of noisy molecular codes". Physical Review Letters. 100 (4): 048101. arXiv:1007.4149 . Bibcode:2008PhRvL.100d8101T. doi:10.1103/PhysRevLett.100.048101. PMID 18352335. ↑ Sella G, Ardell DH (Sep 2006). "The coevolution of genes and genetic codes: Crick's frozen accident revisited". Journal of Molecular Evolution. 63 (3): 297–313. doi:10.1007/s00239-004-0176-7. PMID 16838217. ↑ Tlusty T (Sep 2010). "A colorful origin for the genetic code: information theory, statistical mechanics and the emergence of molecular codes". Physics of Life Reviews. 7 (3): 362–76. arXiv:1007.3906 . Bibcode:2010PhLRv...7..362T. doi:10.1016/j.plrev.2010.06.002. PMID 20558115. ↑ Jee J, Sundstrom A, Massey SE, Mishra B (Nov 2013). "What can information-asymmetric games tell us about the context of Crick's 'frozen accident'?". Journal of the Royal Society, Interface / the Royal Society. 10 (88): 20130614. doi:10.1098/rsif.2013.0614. PMC 3785830 . PMID 23985735. ↑ Itzkovitz S, Alon U (2007). "The genetic code is nearly optimal for allowing additional information within protein-coding sequences". Genome Research. 17 (4): 405–412. doi:10.1101/gr.5987307. ↑ Xie J, Schultz PG (Dec 2005). "Adding amino acids to the genetic repertoire". Current Opinion in Chemical Biology. 9 (6): 548–54. doi:10.1016/j.cbpa.2005.10.011. PMID 16260173. ↑ Wang Q, Parrish AR, Wang L (Mar 2009). "Expanding the genetic code for biological studies". Chemistry & Biology. 16 (3): 323–36. doi:10.1016/j.chembiol.2009.03.001. PMC 2696486 . PMID 19318213. ↑ Simon M (2005). Emergent computation: emphasizing bioinformatics. New York: AIP Press/Springer Science+Business Media. pp. 105–106. ISBN 0-387-22046-1. Griffiths AJ, Miller JH, Suzuki DT, Lewontin RC, Gilbert WM (1999). An Introduction to genetic analysis (7th ed.). San Francisco: W.H. Freeman. ISBN 0-7167-3771-X. Alberts B, Johnson A, Lewis J, Raff M, Roberts K, Walter P (2002). Molecular biology of the cell (4th ed.). New York: Garland Science. ISBN 0-8153-3218-1. Lodish HF, Berk A, Zipursky SL, Matsudaira P, Baltimore D, Darnell JE (2000). Molecular cell biology (4th ed.). San Francisco: W.H. Freeman. ISBN 0-7167-3706-X. Caskey CT, Leder P (Apr 2014). "The RNA code: nature's Rosetta Stone". Proceedings of the National Academy of Sciences of the United States of America. 111 (16): 5758–9. Bibcode:2014PNAS..111.5758C. doi:10.1073/pnas.1404819111. PMID 24756939. Wikimedia Commons has media related to Genetic code.